When the weather outside is frightening, your skin is anything but troublesome. Colder temperatures and persistent wind can wreak havoc on your skin. As a mommy-to-be or new mother, you need to make careful considerations about the products that you choose to use on your face. Harsh chemicals are absorbed by the skin and essentially your baby who relies on you for sustenance. The decisions that you make while pregnant or nursing ultimately affects your child which is why it’s important to take the steps necessary to protect your body and that of your infant at all times. Wear pregnancy-safe sunscreen. Protect your skin from harmful UVA and UVB rays. Even when it isn’t really sunny, there is a chance you can get sunburned. Keep you and your child safe from harm by slathering on the pregnancy-safe sunscreen that you use in summer. That way, there won’t be the slimmest chance of the sun harming your skin. Drink plenty of H2O. The more time you spend indoors with the heater on, the more likely you are to become dehydrated. That’s why it’s important to continually drink water the way you would in the warmer weather months of the year. Water is essential for your bodily functions, and it helps remove built-up toxins and waste materials from your body. Drinking water helps your baby, too, so make sure that you keep a refillable bottle with you wherever you go. Gently exfoliate your skin weekly. You’ll want to remove old layers of skin to expose new skin. That’s how you’re able to maintain that beautiful glow that you have. Use a cleanser that has exfoliating properties. You can also dry brush your skin using a bristled brush and small circular strokes. It helps the lymphatic system do its job by removing toxic products from the body. You’ll have a much easier time applying your moisturizer after exfoliating. Moisturize, moisturize, moisturize. Among the most important things you can do throughout the winter is to continue to moisturize your skin. You may find the texture drier than usual which can indicate that your environment is zapping the moisture out of your skin. If you have a heater blasting all day, it’s easy to understand why you’re not properly hydrated. Use your favorite mommy-friendly moisturizer to get your skin back into shape. You may find yourself applying it more than once a day during the coldest and driest days of winter. If the question of “Which skin care product is safe for pregnancy?” is one you need to be answered, don’t worry. Pretty Mommies takes pride in creating and selling products that are natural and safe for mommies-to-be and new mothers. Winter doesn’t need to take its toll on your skin because the right products protect it from harsh weather conditions. 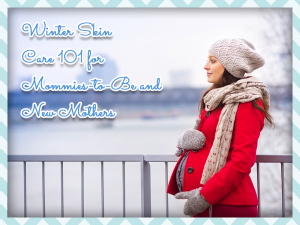 Make Pretty Mommies part of your winter skincare routine. You’ll never be without natural ingredients nor will you ever worry about harming your baby by using the wrong product. We take pride in being the type of company that protects and cares for its customers year-round.